February 1 is finally here and you are going to LOVE the new products in the Spring Summer Idea Book! February brings us a new Stamp of the Month fresh out of this book! 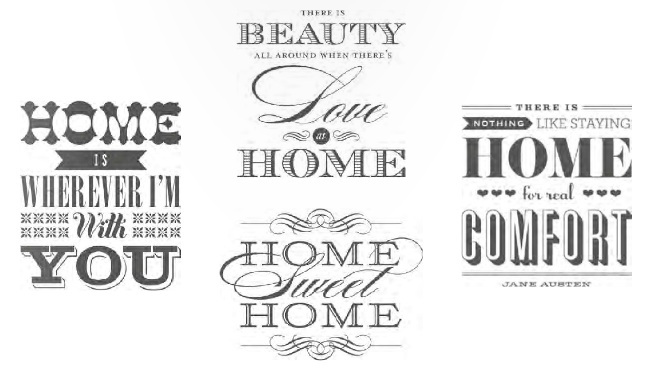 This set of four lovely stamps will be great for cards, layouts, home decor and gift items! 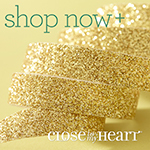 This stamp is just $5 when you place a $50 order of Close To My Heart products! 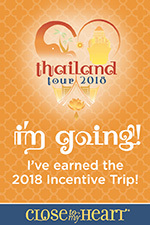 If you have come here from my Laila Harris' blog you are on the right track! The Blog Hop is one big circle so you can start here and go all the way around until you come back to me! If you get lost along the way, you can find a complete list of participating consultants HERE. 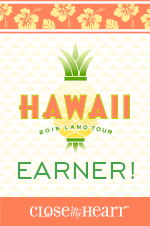 We have over 60 consultants participating in the hop this month! Just look for each link to the next blog at the end of each post. You will surely be inspired but all the art you will see! I created 4 items with this stamp - a 6x6 Canvas wall art, framed art, gift bag and a card. I will show each one individually. I love this frame! This was is a 3-D frame that I had sitting around the house with an old picture of my girls in it. I decided to remove the picture and use one of the stamps as the focal point of the frame. I cut the shape from the Artiste Cricut cartridge (Z1790) and stamped the phrase with pigment inks - Cocoa and Barn Red. Inking just the portion of the stamp I wanted with the pigment inks are very easy because the pads are just 1" square. I added Just Blooms Floret Paper Shapes (Z1764) and new Durable Artisan Studs (Z1816). My next project is this card. I used the new Distressed Backgrounds (D1544) stamp with Outdoor Denim ink to create a hounds tooth pattern paper. I stamped the phrase in Barn Red ink and then again in Outdoor Denim and Honey. I cut out the "is" banner and "YOU" and used foam tape to place it over the Barn Red portion of the stamped imaged. I added 3 buttons from the new Wooden Mini Medley Collection (Z1837) and Burlap ribbon (Z1760). Here is another NEW PRODUCT! 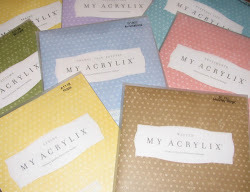 The My Creations 6x6 Canvas Display (Z1818). Because this is a home decor item and would be hanging on a wall, I used our pigment inks. These will not fade in the sunlight. I used Barn Red with the hounds tooth Distressed Backgrounds stamp. My phrase is stamped with Olive, Barn Red and Honey. Again, I used some Wooden Mini Medley Accents with Burlap Ribbon. Check out that little flower flourish! I've already got another set of the cute little Wooden Mini-Medley's on order! And last, another NEW PRODUCT! I love these My Creations Muslin Drawstring bags (Z1822)! They make great housewarming gift bags (PERFECT size for the small Scentsy scents)! I stamped my bag with Indian Corn Blue and Olive Ink. I masked the center of the bag with the image stamped on a piece of scrap paper, Then used the leafy stamp from In The Background (D1540) stamp set to create a border around my "Home Sweet Home". Be sure to join me on February 14th for our New Product Blog Hop! It will be lots of fun! Now hop on over to Tamara Pope's blog to see what she has created for you! There are only 3 days left in January which means there are just days left to get some of those popular retiring products! Many have already sold out. Don't let the time pass you by or you will miss out! Another favorite retiring paper pack is the Victory Paper Pack: (X7150B) If you have boys or men in your life, this is the perfect paper for scrapbooking or making masculine cards! Don't forget the match Victory Stickease Assortment (X7150C)! These are the perfect accents to the Flirty paper and I LOVE the pins! They definately add a sparkle to your projects! Three shades of shimmer make these great for every project! I could go on and on but then my post would be a bit long. You can see all the products on the retiring list HERE. 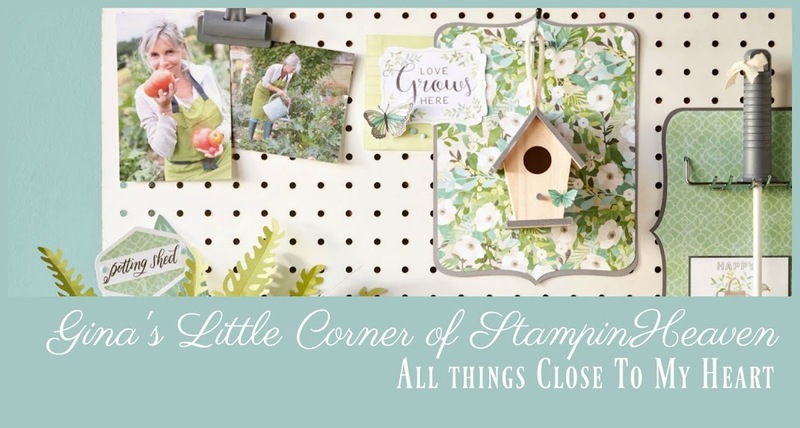 So get out your Idea book and mark the items retiring, then go to my website - www.stampinheaven.ctmh.com and order before they are gone forever! Finally! A sneak peek at the 7th new paper pack coming February 1! I was waiting for just the right sketch and found one on Clean and Simple Stamping! This 7th paper pack is Tommy (X7169B). It has a nautical theme with colors of Cranberry, Outdoor Denim, Honey and Desert Sand. There are so many possibilities with this paper. Here is my card which shows four of the patters offered in this paper pack. 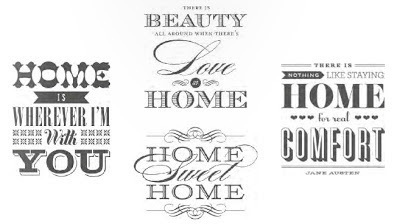 The banners were created with the Art Philosophy cricut cartridge: <Banner2>, <Banner3> and <Banner4>. 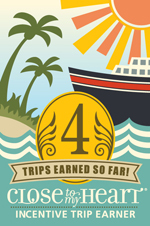 I cross-stitched each banner to the side bar with Cranberry Bakers Twine from the Harvest Assortment (Z1751). My sentiment and the pennant border are stamps from the Tommy Workshop on the Go exclusive stamp. This stamp is only available with the Tommy WOTG kit (G1058). I added sparkles from the Clear Sparkles Assortment (Z1752). Tommy and the Tommy Workshop on the Go Kit will be available February 1 when ALL the new Spring Summer products will be available for viewing on my website! If you live local to me, be sure to stop by my Open House Event on February 16 to see all the new products first hand! 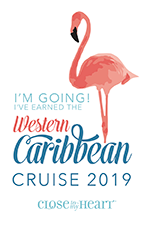 I have lots of exciting products to share, fun card you can make, many door prizes PLUS Cash and Carry items added to my Sale Corner! 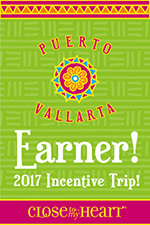 Watch for more details coming soon! Not local? You can still see all the new products by purchasing the new Spring Summer Idea Book now! For just $5 I will mail you the new Idea Book. I will include a Petite Perk stamp as a Thank You for ordering! I will be adding a Mystery Hostess Party to my website on February 1! 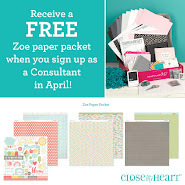 If you have seen some products that you'd love to order in February, be sure to join my Mystery Hostess Party and you could win $20 in FREE Close To My Heart products! Your name will be entered into the drawing for every $25 you spend (before shipping and taxes are applied). Drawing will be held on February 28 so you will have all month to enter! Have you ever created a card and even though you were finished, you felt like something was missing? This is how I felt last night after I finished my card for Freshly Made Sketches. I even photographed and edited the picture for my post. It was late when I finished editing the picture, so I decided to leave the post writing for today. I left the card sitting out. As I was walking through the room this morning to leave for work I glanced at the card and that feeling of "something missing" come over me again. I guess all I needed was a little time to meditate on the card during my 50 mile drive to work. As I was driving it suddenly came to me! It needed Baker's Twine and something round..... hmmm..... an Irresistible Chipboard Shape! I couldn't wait to get back home and make those little adjustments to my card. I'll share both and see what you think. Now I feel like it's complete! The paper is the new Surf's Up (X7168B) paper that will be available February 1. I also included TWO other new products on this card - the pinwheel is one of 2 pinwheels included in the Surf's Up Assortment (Z1841). The assortment also includes 2 yo-yos and 4 printed wooden buttons. SO CUTE! The other new product is Irresistibles Framse (Z1843). This chipboard set includes 18 frames in 3 resist patterns: stripe, polka-dot and houndstooth. The stamp used, Just Chillin' (C1495) is not new to this book but it is new to me! I purchased this set last year and this was the first time I used it! I love the little umbrella! I stamped it in two colors and paper pieced the sections. The Baker's Twine is from the Paradise Assortment (Z1702). I added Clear Sparkles (Z1752) to finish the card. Surf's Up, Surf's Up Assortment, and Irresistibles Frames will all be available February 1. Want to see ALL the new products? If you live local to me, be sure to save February 16 on your calendar! I'm having my annual Open House to introduce the new Spring Summer Idea Book! Watch for more info! I've been waiting for just the right sketch to show off this next new paper! This week's Mojo Monday sketch was just what I needed! Today's sneak peek is Claire! I LOVE this fun print and can't wait to create some cool layouts with it! The Claire paper pack (X7166B) features the colors of Hollyhock, Sunset, Cranberry and Outdoor Denim with Cashmere! Everything on this card will be in our new 2013 Spring Summer Idea Book! I used a Perfect Fit - Birthday (B1417) stamp on this card because I'm trying to make more Birthday cards this year! I cut our new Outdoor Denim Chevron Ribbon (Z1808) in half. The 3/4" wide ribbon was just a bit wide for the small square but I really wanted to use this cool ribbon! I added 3 of the Durable Artisan Studs (Z1816) to the ribbon. And how about that fabric flower?! That is one of 3 fabric flowers from the Claire Assortment (Z1813). The assortment also includes 3 pink acrylic flowers and 3 clear acrylic flowers. SO CUTE!! Thanks for stopping by! I've still got two more paper sneak peeks to give you so stay tuned! Claire, Claire Assortment, Durable Artisan Studs, Outdoor Denim Chevron Ribbon and the Perfict Fit - Birthdays will all be available February 1. Want to see ALL the new products? If you live local to me, be sure to save February 16 on your calendar! I'm having my annual Open House to introduce the new Spring Summer Idea Book! Watch for more info! 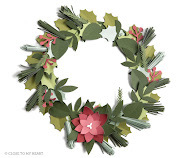 Here is another sneak peek at a new paper pack in the Spring Summer Idea Book! This paper is called For Always (X7165). The 6 different patterns are all black and white. This paper looks great with pops of colors. I used Ruby for my pop of color on this card based on the colors in the Dynamic Duos Color Challenge. I based my card on the sketch from Sweet Sunday Sketches. No stamping on this card! I used the Artiste Cricut Cartridge (Z1790) to cut my shapes - even the tulip shape flower with the flourishes. The Black Tulle Ribbon (Z1798) creates the bow pulled together by a button from the new Black Assortment (Z1821). I used bitty black sparkles from the Black and Grey Sparkles (Z1754) on the tulip. I decided not to add a sentiment to the card. I think it might have gotten lost in the pattern! But, I really like the way this card came together. Thanks for stopping by! I've still got three more paper sneak peeks to give you so off to my craft room I go. All this new product has got my mojo going! For Always and the Black Button Assortment will all be available February 1. Want to see ALL the new products? If you live local to me, be sure to save February 16 on your calendar! I'm having my annual Open House to introduce the new Spring Summer Idea Book! Watch for more info! Later Sk8r - Another Sneak Peek with a Birthday Card! It's been a few days since I've posted because I actually haven't been in my craft room. I told myself that I HAD to get all my tax stuff together before I could return and play. It was a daunting task that took me two days but by Saturday afternoon I was back in my favorite room! After finishing up some upcoming Stamp of the Month projects (to be revealed on Feb 1) I pulled out another new paper pack to play with. This time it's Later Sk8r (X7167B). Although I don't have any boys to be scrapping I do LOVE this paper and I can absolutely make it work for my needs because I love the patterns and colors used. I went back to the Seize the Birthday challenge for this card I made because this week they are making BOY birthday cards. The sketch is same as last week - you can see the GIRL birthday card I made with Chantilly paper HERE. 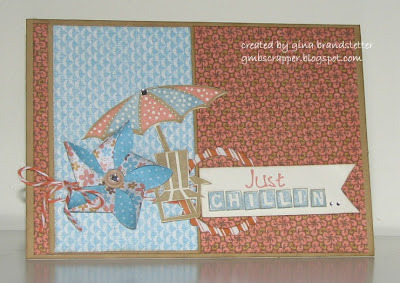 I used Slate cardstock as my background but I added some texture to it by using the background stamp that is included in the Later Sk8r Workshop On The Go (G1057) kit. I stamped it in Outdoor Denim ink. To give my card a 'rugged boy' feel, I scissor distressed the edges of the papers and cardstock. My frame is also stamped in Outdoor Denim ink with our new Perfect Fit - Frames 2 (D1536) stamp set. It coordinates perfectly with the Artiste Cartridge. Next, I used another new stamp set - Perfect Fit Birthday (B1417) and Slate Ink to layer on top of the frame. I added Pewter Brads and a Pewter Photo clip from the Mini Medley Accents - Pewter collection (Z1487) to finish off the card. I'm also entering this card into the Friday Mashup Challenge - Make a Birthday cards and add brads! Later Sk8r, Perfect Fit Frames 2 and Perfect Fit Birthday will all be available February 1. Want to see ALL the new products? If you live local to me, be sure to save February 16 on your calendar! I'm having my annual Open House to introduce the new Spring Summer Idea Book! Watch for more info! 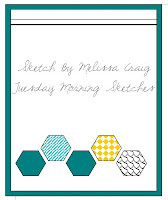 This week's Tuesday Morning Sketch was perfect for Close To My Heart's new Honeycomb stamp set. I couldn't wait to get home and use this set for this sketch! I combined the sketch with this week's Color Throwdown. I used the ink colors of Smoothie, Sunset and Blush for my honeycombs. The outline is stamped in Desert Sand. And what do you know - there is that burlap ribbon! BTW, I've used so much burlap lately that I'm getting low again so will be ordering more! I wrapped some Smoothie Bakers Twine around the burlap and tied a little bow. The sentiment is from my new Joyful Birthday stamp and also stamped in Desert Sand. In the midst of getting all my new product, I had an idea for a Valentine card that was inspired by a challenge on the Moxie Fab World blog - create a card with a window (Challenge #60). I've had this heart shaped LOVE stamp for a while that I have never used. For the last two weeks, I've been pulling it out of my stamp box trying to come up with a unique way to use it. When I saw Cath's challenge to create a card with a window, I knew exactly how I would create my card. I used my cricut to cut the card (7x5) and with the gypsy I was able to place and then cut my heart shaped window right where I wanted it. I cut the opening 1/4" larger than my stamped heart shape. My paper is from the Pear & Partridge paper pack (a Christmas paper!) but I love this print and think it has a romantic feel to it. To make it even more romantic, I added the Colonial White Rosette Ribbon around the edge of the opening and then added little pearl opaque adhesive gems. My pleated ribbon at the bottom of the card is Color Ready Seam Binding ribbon that is just plain - no color added. After cutting out the coordinating heart image with the Artiste cartridge, I stamped my heart shaped LOVE with Desert Sand Pigment ink and used clear detail embossing powder to give it a shine. Foam tape was added to the back of the heart so that it would pop up into the window. The day after the new Seize The Birthday challenge was posted, my new products for Close To My Heart's Spring Summer Idea Book arrived. As I opened each packet of new paper I knew immediately that I would be creating a card with Chantilly for this challenge! If you haven't discovered Seize the Birthday yet, it's brand new and I'm going to really like this one. It's all about Birthday cards! 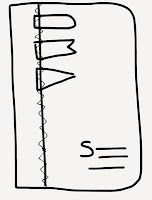 They will post a new Sketch every two weeks - Use the sketch the first week to create a 'girly' card. The second week you create a masculine card using the same sketch. I can already tell that this one will be fun! Here is my card for the 'girly' week! The papers are from the new Chantilly (X7163B) paper pack that will be available February 1. I used two brand new stamps set that will be released then also. The frame, which coordinates with the Artiste Cricut Cartridge, is from the set Frame Flair (D1548). The sentiment is from Joyful Birthday (B1419). This set has four different styles of "Happy Birthday". LOVE IT! I stamped the frame in Cotton Candy ink and the sentiment in Pear. Finding coordinating ribbon was very easy. I sponged pear ink onto Color Ready Seam Binding Ribbon (Z1732) to get a perfect match! A few sparkles from Sparkles Clear Assortment (Z1752) and Bitty Sparkles (Z1263) add the finishing touch! I'm headed back to my craft room for some more creating time! Hootin' Owl - Whooo's Your Valentine! Whooo's Your Valentine - CARD!